Randall K. Roenigk, MD, Assistant Executive Director; Thomas D. Horn, MD, MBA, Executive Director; Erik J. Stratman, MD, President; Edward W. Cowen, Vice President; Lela A. Lee, MD, Associate Executive Director. Mary S. Stone, MD, Director; Allison T. Vidimos, Director; Christine J. Ko, MD, Director; Moise L. Levy, MD, Director; Julie V. Schaffer, MD, Director; Anna L. Bruckner, MD, Director. 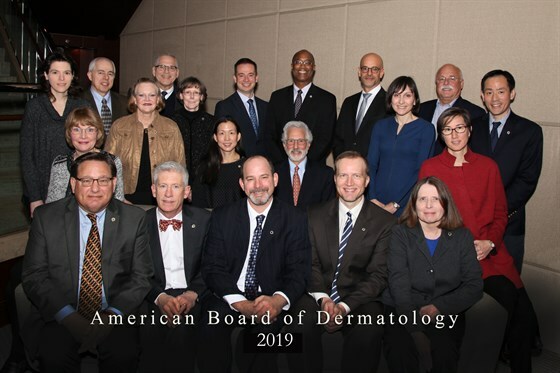 Tammie Ferringer, MD, Director; Dirk M. Elston, MD, Director; Warren R. Heymann, MD, Director; Julia R. Nunley, MD, Director; Keith A. Choate, MD, Director; Carl V. Washington, MD, Director; Chris K. Bichakjian, MD, Director; Bruce M. Bartels, Public Member; Hensin Tsao, MD, Director.